A note from Lindsey: Halloween is almost here! The time for ghouls, monsters and otherworldy creatures is upon us. This post is the first in TMP’s four-part, through-the-decades Horror Half-Week series in honor of the spooky holiday. 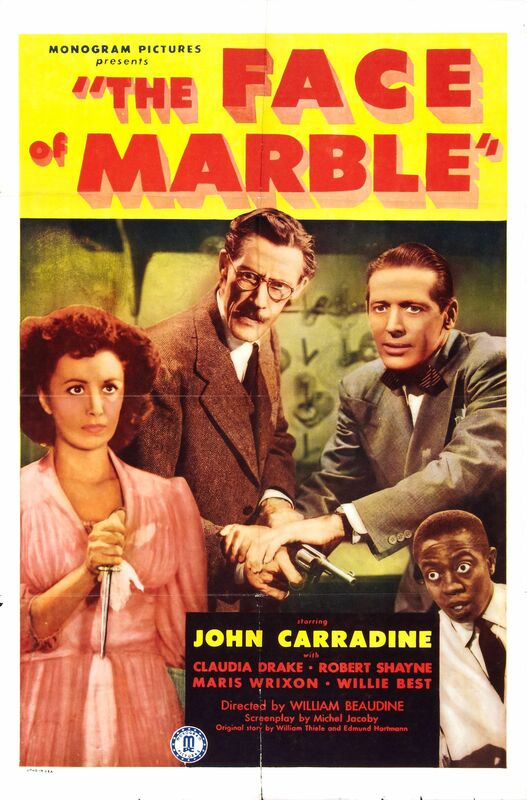 Today we’re talkin’ 1940s B-horror with 1946’s The Face of Marble. Stay tuned for posts on horror films from the 1950s, 1960s and 1970s. Dr. Charles Randolph (John Carradine) is obsessed with the idea of bringing the dead back to life. With the help of his young lab assistant, Dr. David Cochran (Robert Shayne), Charles conducts experiments in which he attempts to shock dead subjects back into the living world. Completely wrapped up in his work, Dr. Randolph fails to realize that his wife Elaine (Claudia Drake) is falling for David. In fact, he doesn’t seem to care much about his wife at all. Everything revolves around these twisted experiments. Unluckily for Charles, Elaine has a very strong ally in housekeeper Maria (Rosa Rey), who is not only skilled in the art of black magic but also extremely loyal, willing to do whatever she can to help Elaine find happiness. William “One Shot” Beaudine (1943’s The Ape Man) directs 1946’s The Face of Marble, a horror written by Michael Jacoby (1936’s The Charge of the Light Brigade), based on the story by Edmund Hartmann (1953’s Here Come the Girls) and Wilhelm Thiele. The film was released by one of Poverty Row’s most well-known studios, Monogram. Quite stereotypically, The Face of Marble kicks off on a dark and stormy night. On this spooky night, Dr. Randolph is conducting one of his experiments. Apparently he didn’t get the memo that it’s never a good idea to try to wake the dead – especially when there’s a storm brewing outside. Between the eerie atmosphere of the storm and the nature of the experiment, the viewer knows right off the bat that something is bound to go wrong. 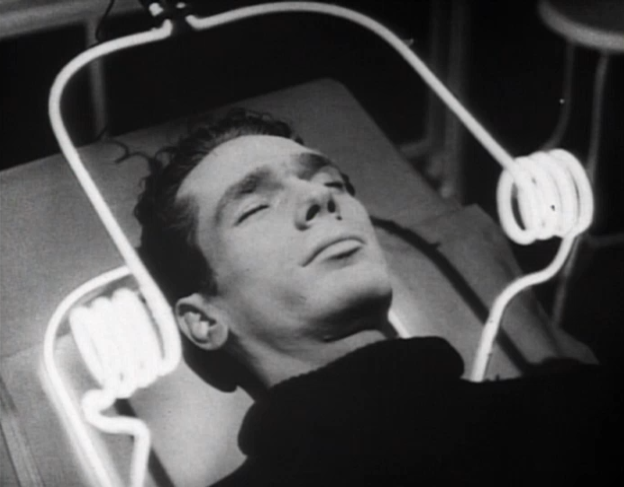 The film leaves the audience anxiously waiting to see what the consequences of the experiment will be. The storm isn’t the only thing that’s stereotypical about this film. Just about everything in it is conventional. The main character is a mad scientist. His rival is a practitioner of voodoo. The dead can only be awoken into an incoherent, zombie-like stage. Our mad scientist even creates a monster, when he kills and then attempts to revive his wife’s dog. There are a few positives here. The film is fairly typical of Poverty Row’s B-horror productions, but the quality is very good considering the limited resources at hand. The special effects are decent (minus the “marbleized” look of the revived, which doesn’t look like marble at all). The set design of the lab is great, with very high-tech props available for use in the experiments. The script itself is decent. There are a few good twists thrown in, but it isn’t as high on either suspense or thrills as it could have been. It doesn’t live up to the potential of its typical but exciting opening. The best thing about the story is Carradine’s character, who seems to be more than a little bit crazy. So crazy that he kills a dog, with no remorse and no thought as to how the loss will affect his wife, who is highly attached to the pup. Carradine delivers the film’s best performance in his thoroughly unlikable, highly obsessive character. Ack, that’s too bad the movie didn’t turn out to be a winner. Usually I love films that start with “a dark and stormy night”, as you put it. I had high hopes that it would at least be enjoyable cheese, and I love John Carradine so I was definitely bummed when it didn’t meet my expectations. Netflix made up for this poor suggestion though, by leading me to tomorrow’s film, ‘Attack of the Puppet People’ haha.